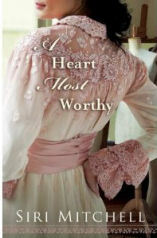 Also this week, CFBA is introducing A Heart Most Worthy by Siri Mitchell. This is only the second book I've read of Siri's. After finishing them both, I would say that she excels at historical fiction. Although full of details, A Heart Most Worthy doesn't feel like you're cramming for an exam with more facts than your brain can handle. Easily weaving the facts of a bygone era with vibrant characters, Siri's story is one you'll keep thinking of even after you finish the last chapter. There are times in the book, that feels like a narrator is telling you the story. Sometimes it made sense and was enjoyable to read...other times, I felt it didn't fit and only interrupted the flow of the story. For example, you are reading from one of the girl's perspective when the 'narrator' jumps in and says, 'You may not have done what she did, but don't be so quick to judge,' or something like that. Different. And, sporadic. Hadn't ever read a book that did it quite that way before. Not necessarily unlikeable, but definitely different. FYI, the 'Christianity' in the book is Catholic, as each of the three main characters are Italian immigrants and the time period, early 1900's. I am quite sure that the Catholic bent is historically accurate of that time, place, and people, however, as a born again believer, I did not enjoy the many scenes of confession and crossing ourselves. I'm so glad you enjoyed the book! Writing from an omniscient perspective was a change for me. While I enjoyed it, I'll be back to my normal first-person for next spring's release, The Messenger. Thanks for taking the time to write and post a review!